In many ways, western Massachusetts is an ideal environment. Industrial roofing does not face the stifling heat and humidity of America’s southeast, or the blazing sun and ultraviolet damage of America’s southwest. Still, Massachusetts does have tough winters. The weather takes an enormous toll on any industrial roof, no matter its location. If your industrial building is like many, you are wringing the last bit of useful life from the building’s roofing material. Industrial roofing is often built-up roofing, single-ply, or modified bitumen. These are all economical, but cannot last forever. Weather ages industrial roofs fast. 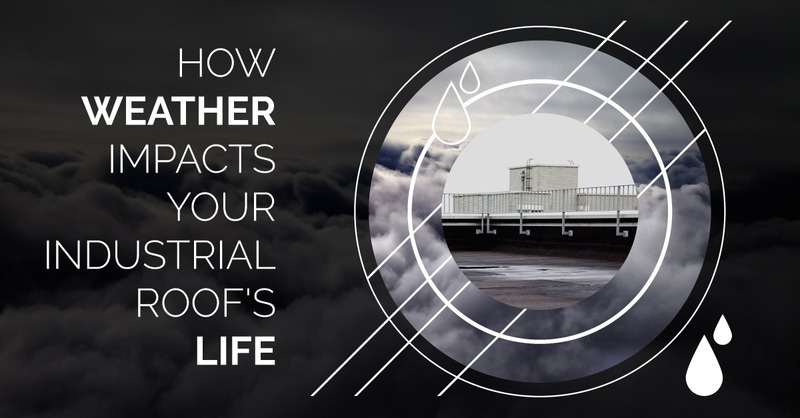 Constant freeze-and-thaw cycles, standing snow and ice, and nor’easters blowing in rain can all rob your industrial roofing of the chemicals and coatings it needs to stay water resistant. Your industrial roof is a complex system of interlocking parts, starting with the roof deck and moving up in layers through the insulation to the final surface. Add to that proper drainage (gutters; downspouts; internal drains, parapet scuppers, or both) and you have a very challenging roof environment. The weather attacks it all. In spring and fall, we all set our clocks ahead and back (spring ahead, fall back). These are ideal times for roof inspection. In spring the worst of winter is past, so a qualified commercial roofer can perform a thorough inspection to reveal areas where your industrial roofing took a beating from ice and snow. In fall, another inspection can prepare your roof for the winter ahead. Tears, oblong holes around attachment points due to expansion and contraction, and loose or lifted seams. Once you realize how the weather of western Massachusetts takes a toll on your industrial roofing, you also realize you need a roofing contractor capable of preserving your roof. Let Vanguard Roofing stand with you to preserve and protect your industrial building’s roof. Contact Vanguard Roofing today to learn how we can reduce weather’s impact on your industrial roofing.